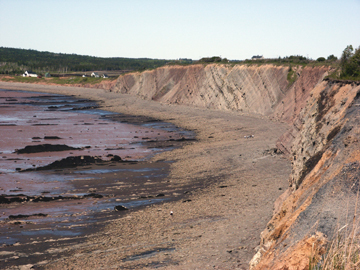 The giant Joggins cliffs in Nova Scotia, which are world famous for their expansive buried fossilized forests, dwarf people walking along its beaches. Some geologists now think they know how the trees became preserved in the first place, some 300 million years ago. Courtesy of Michael Rygel. The up-to-6-meter-tall (19 feet) fossil trees that were buried and preserved intact, as well as 76 coal seams, lie in the Joggins Formation, part of the Joggins Section, one of the thickest Carboniferous-aged sections in the world. Oddly, the rapidly deposited section  4.2 kilometers of sediment piled up in just 4 million years  also changed substantially in thickness, an indication of subsidence. The dramatic thinning, combined with sediment deposition rates rarely seen on land, left geologists puzzled about what drove the basin to sink steadily and repeatedly, burying 63 layers of fossilized trees in the process. Now researchers say that they have found the answers to some of the mysteries of the formation in a simple substance: salt. The fact that there are standing trees is not terribly unique; whats unique is that it happened more than 60 times, says sedimentologist Michael Rygel of the University of Nebraska in Lincoln. We needed a way to explain how the conditions stayed just right for millions of years. Geologists first suggested the involvement of the underlying Mississippian-aged salt decades ago, but the high-quality seismic data needed to investigate it only recently became available. Rygel and John Waldron, a structural geologist at the University of Alberta in Edmonton, turned to seismic lines recorded in 2002 by Devon Canada, an oil company prospecting in the Cumberland Basin. We can show, from the seismic profiles, that those areas were actually subsiding because salt was flowing out from underneath them, says Waldron, who reported the results with Rygel in the May Geology. The seismic profiles show a salt weld beneath Joggins, he says. When sediments are deposited on top of salt, the added weight squeezes the salt out, Waldron says, and the newly deposited layers then weld to older sediments that had underlain the salt. Additionally, the new study shows how salt, usually associated with the trapping of oil deposits after they have formed, could be related to the formation of coal. A basin needs to be sinking rapidly enough to allow plant layers to accumulate, but not so rapidly that the layers drown in deep water  conditions that would be produced by the removal of salt layers, the researchers say. To the best of our knowledge, this is the first time that salt withdrawal and coal formation have been linked, Rygel says. The Joggins site, described in Lyells 1872 Principles of Geology (a book that helped found the field of modern geology) and in Darwins 1859 On the Origin of Species, is particularly famous for fossilized hollow trunks, inside which were found the oldest known fossils of true reptiles, the first four-legged creatures to lay eggs on dry land.